While I am waiting for the proper parts for leveling the print bed I came up with an alternative way. It's not something I would recommend if you have a heated print bed, but as I do not it's worth trying. I found some packing foam and som IKEA cupboard bolts which should do the trick. The foam has the right springiness and by changing the size of the pieces you can get the proper resistance. Covering the whole back side of the bed was too much I found out. Notice the four, black, drinking straws. These had the exact right diameter to match the predrilled holes and keeps everything nice and centered. First try. I found that since I had to tighten the rear bolts almost all the way the small pads of foam I started with weren't enough in the front. After tightening of the rear side. Added some more foam and the result turned out much better! Leveling took some time since tightening or loosening one screw affects the height of the nearby foam blocks so I had to re-measure and adjust the other bolts several times before it all was level. Still; I'm happy to be able to use the printer until I get some better parts. It's been a long journey, but now, nearly 10 months after I first ordered my 3D printer it's finally done! Well, as done as a gizmo like this is ever going to be I guess - it will forever be a work in progress with parts being tuned and such. In my last post I though I were finished painting, but the perfectionist in me didn't like the finish on the sides of the parts. So, more paint! Some of the other parts. Masked and ready for paint. Finally being happy with the paint job it was time to move on with the assembly. The biggest issue was the error in the routing of the feeder part. At first I thought I would see if I could fix it myself since I only needed to drill some holes and remove some MDF to make room for the parts. Well, a seemingly easy job botched up mainly because of me sitting on my living room floor and not having access to a proper workbench. Result of drilling in MDF without proper support. After e-mailing Richard about this he promptly replied that he was not only going to send me new feeder parts, but also the newest revision of the hot-end as compensation. That's what I call great customer support - thanks Richard! :) A couple of weeks later I was ready to proceed. two extruders if I on a later point want to add one more. The main difference between the old and the new extruder being a connection piece made of peek (the brown plastic in the picture). Peek handles heat very well so we'll have no issues with the plastic in the bowden tube retainer (blue) melting and we can skip the fan and heat sink as well simplifying the design greatly. 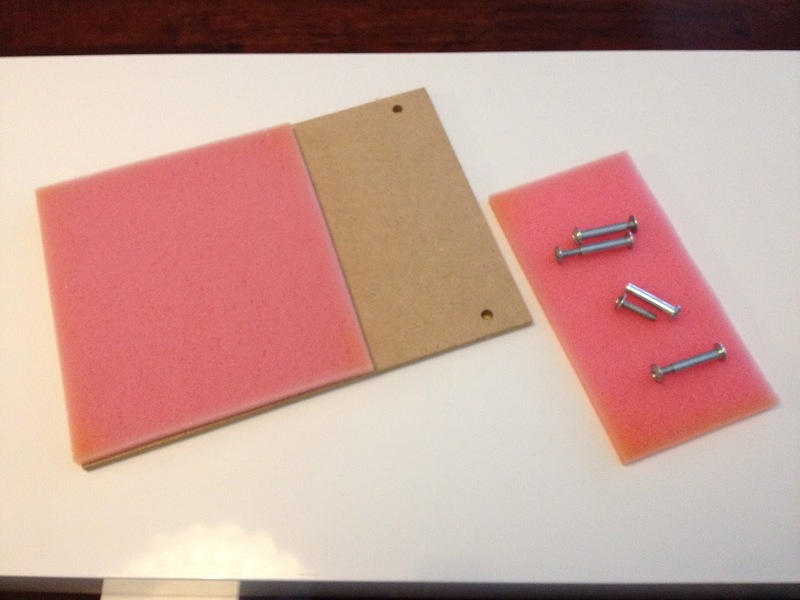 EDIT: As mentioned in the comments below the way the print-head is assembled in the pictures is wrong! 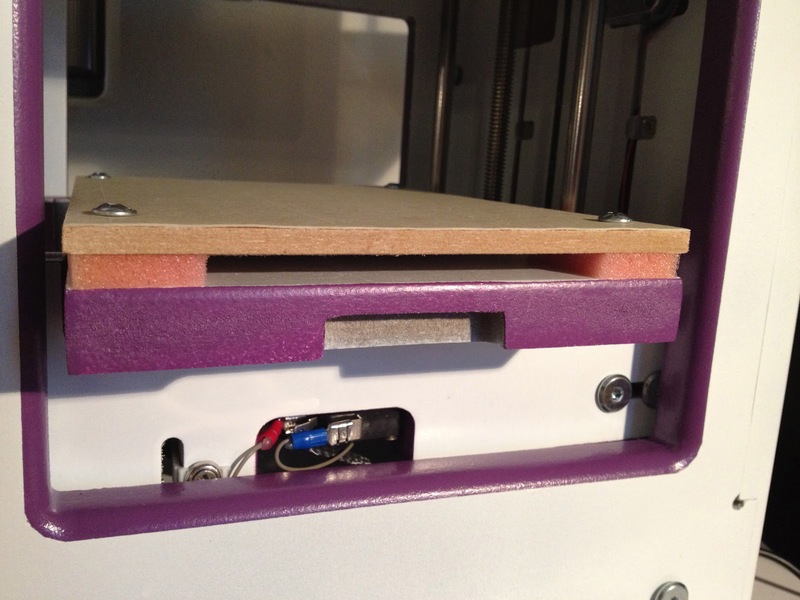 The correct way is (from the top): push fitting, MDF (upside down from what's seen here), peek and then the nozzle. Unfortunately I forgot to take new pictures before installing the print head in the SUMPOD. Belt in place for the X-axis. cables and at the same time making everything more tidy. and then add the plastic casing. I imagine final assembly took about 3-4 days in total. Much of that time was checking and double-checking the instructions with the SUMPOD forum as well as the other build-logs out there. Instructions were not always straight forward or the same and I wanted to avoid having to pull anything apart - better to get it right in the first place! Although I did test the electronics before I assembled the SUMPOD it was a bit nerve wrecking the first time I turned on the unit. To my astonishment everything worked perfectly! From what I had read on the forum I knew some people had issues with the feed mechanism not working in ReplicatorG so I weren't surprised my unit had the same issue. A quick swap to Pronterface showed the feeder worked fine albeit reversely. Changing the Configuration.h file in the Sprinter firmware fixed that issue. Next up were calibration. Unfortunately I didn't have much to go with on how to to that exactly so to make a long story short I ended up with a nasty collision between the printer head and the print bed - even though I had my finger on the power button. The result of the collision left my printer bed crooked on the Y-axis. I don't have a picture to show this, but it is visible to the eye and I guess it's about 3mm difference between the top and bottom. It was all my fault and being angry with myself I had to leave the project alone a couple of days before I could continue. Not necessarily a bad thing since it gives the subconscious time to work out whatever needs to be done to fix the problem. Which in this case were; where is Z = 0. 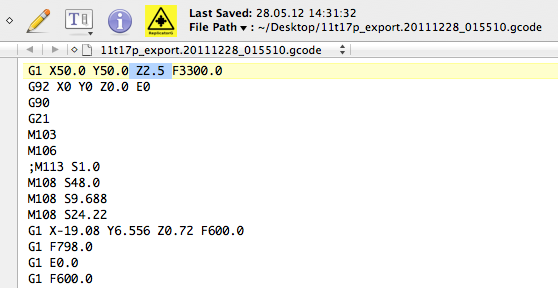 Browsing the forums and the Wiki led me to this g-code from Airtripper. Experimenting with the Z value (and my finger on the off-button) I started with the high value of 10.0 and working my way down. 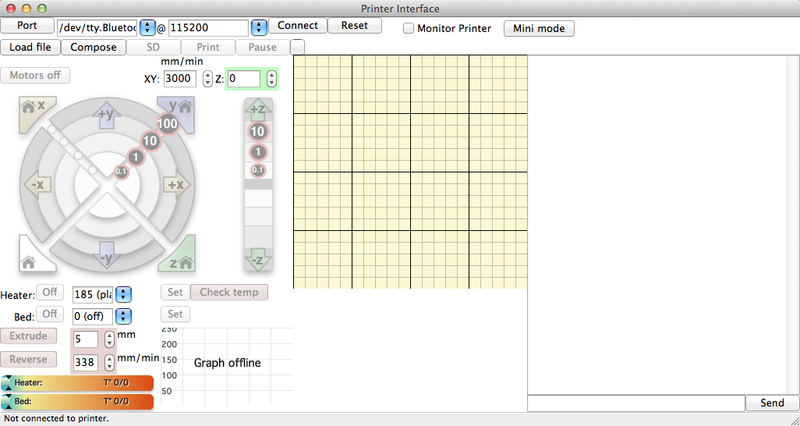 With Z = 2.5 I get the correct distance from the printer head to the bed. It's not ideal yet since the bed is not flat compared to the print head on the Y-axis. Anyways; I'll look into the Sprinter firmware to see if I can set the value there or if I have to pre-process all my g-code with this value. Since I still have issues with ReplicatorG I continued to use Pronterface. 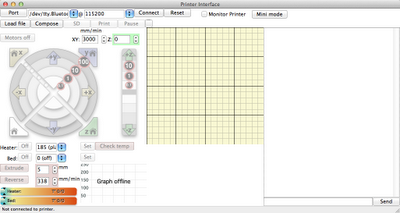 Although it doesn't have a 3D view of the model to be printed, like ReplicatorG has, I love the manual controls. The temperature monitoring also works as expected. That's another area where I have had issues with ReplicatorG with it only sporadically showing any readings. I'm not sure if that has anything to do with me running 0029 or the Sprinter firmware, but I would guess the former since Pronterface works fine. Closeup of the first print. Seems like the registration is good! The lens is to blame for the apparent skewing. I'm impressed by the quality of the print and what little can be seen of artifacts I believe can be linked to the bed and the distance between the bed and printer head being a bit too high. I can clearly see the thread, but playing with the parameters of Skeinforge should allow for higher resolution in that aspect. I did try to remove the raft, but it's firmly stuck so a knife is needed. After I have made some adjustments I'll try to print without a raft and see how that goes. What remains now is to get the bed leveled. I'm considering a variation of the mechanism described on the SUMPOD wiki, but it's hard to source springs here in Norway so if my RC-Car spring spare-part idea doesn't pan out I have to think about something else. I also need to work on the display contrast. Not that I use it, but It's nice to have it working anyway. With the current setup I use a 3K resistor which is a bit much since the contrast is too low.